With most accounting firms recruiting talent at least a year before graduation, the Department of Accounting at UNT developed a way to meet the needs of employers, while simultaneously providing students with an easy path to meet their career match. 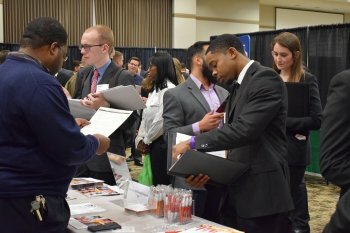 February 1 marked the fourth annual Meet the Firms Night, co-hosted by the Department of Accounting and UNT Career Center, which brought together nearly 200 students and 30 accounting firms. The employers in attendance represented 80% of the top 25 firms in the Dallas-Fort Worth metroplex. “As a UNT alumna, it is always a great pleasure to be back on campus. The accounting program at UNT has provided Grant Thornton strong professionals throughout the years, and it will always be one of our top universities to recruit from,” said Jordan Gaunt, Grant Thornton University Recruiter. Special thanks to our premiere sponsor firms for making this event possible, including Beaird Harris, CliftonLarsonAllen, Dixon Hughes Goodman, LLP, Grant Thornton, Henry and Peters, P.C. and Howard, LLP.